As some of you read, I’ve returned to riding Metro after a few months driving to work. The cost of parking is still such that taking Metro often makes more sense. Apparently, though, it makes less and less sense for many people. The Washington Post reported that due to the increase in fares, bus ridership was down 7%, and while Metro ridership remained the same, Metro found that up to 3% of riders had moved their commute from the highest fare times. In a way, this is exactly what’s needed to manage capacity. Market forces tend to balance out between supply and demand. Of course, it’s naive to think of a mass transit system in those terms. Yes, Metro does have capacity issues — especially during rush hour. But making it more expensive for the neediest people to get to work is going to turn into a nightmare. So far, that has resulted in a 4% decrease in revenue. Which will likely mean higher fares. And the cycle continues. And while rail ridership continues unabated, Metro is seeing a change in ridership. There are fewer short rides — people are walking, taking the bus or Circulator, or a bike. Metro also found that riders were taking fewer long trips, too. Anecdotally, I know from friends who are further out that they would rather drive. With the highest fare running $5.45, when you factor driving to the Metro, paying for parking and a round trip ride from the outer suburbs, the cost is probably higher than what most downtown garages charge. 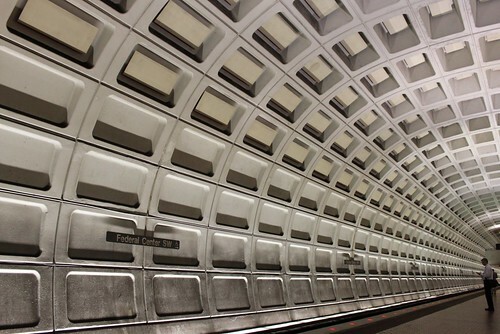 Michael Perkins at Greater Greater Washington has a good post about the options Metro has to simplify its fare structure. I think many people are confused and annoyed by the complex fares, and simple is almost always better. But I don’t think that goes far enough. I think Metro needs to get off the distance traveled fare scheme and figure something out that’s much simpler. London’s zone system has been batted around, but London is also much larger (in every measure) than Metro. I’m sure we could do well with a rail zone system that has zones marked out by DC, inner suburbs, and outer suburbs. But, honestly, I still think the best argument is for a flat fare, similar to New York’s. I’ve made that argument before, and I think it still holds. It will have the added benefit of eliminating the tiered pricing system we have, and then, perhaps, people can stop complaining they aren’t getting more rush hour service for their rush hour dollar. Because Metro isn’t going to get better anytime soon. Couldn’t agree more – a flat fare on Metro is long overdue. That would put the greater financial burden on those that take short trips (tourists especially), while taking it off those that travel long distances (including lower income families from the outer suburbs). The next step is for them to figure out a better solution to Metrobus fares, which is also causing a decrease in ridership. I know I personally always take my county bus (PG County’s TheBus) when I can because of the cheaper fare and more reliable timetable. I don’t buy the fare complexity as a reason for people not using the system. WMATA’s stats indicate that SmarTrip usage is above the 75% mark on rail and it and the ability to go negative remove a lot of the pain. Perhaps I’m projecting but I’m far more likely to blame the seemingly unpredictable wait time between trains as an issue. At 7pm the other day I narrowly got on a train that, if I’d missed it, would have been the last for 15 minutes. If I’d opted to transfer to the yellow line rather than getting off at Metro Center and walking the few blocks I’d have added another 11 minute wait. I had that flexibility because of where I was going (and technology to tell me it would be a faster option) but that adds up to an extra 26 minutes I could have added to my trip. That’s not a negligible delay if you need to get somewhere at a particular time and it’s a large percentage of my non-working waking hours. I think those delays are a bigger motivator for drivers with a choice. Folks already making a car payment & covering insurance don’t save anything but gas and parking fees when they opt for Metro instead. If the savings is small in comparison to the cost of time – a non-replenishable resource – ridership is going to decline. Simple is better, like the Circulator. Easy to figure out where it goes, how often it runs (every ten minutes) and it only costs a dollar. Its ease of use is a big part of its success. I’ve lived in DC for years and I couldn’t tell you what your fare might be. Peak? Off-peak? Peak of the peak? Metro is also too unpredictable. It used to be you had a good idea of what you were buying. 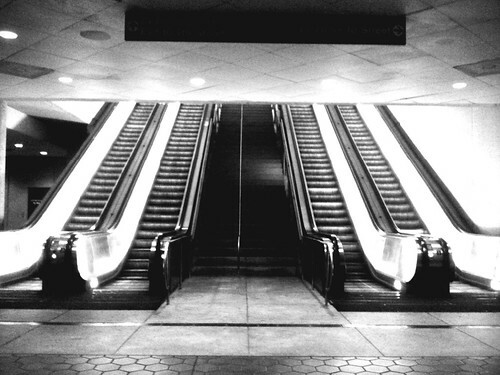 Now, going down those non-working escalators, you don’t know what might happen – wait 1 minute or 20? Get stuck in a tunnel? Fight on the platform? Train too crowded to get on? Anywhere downtown, I walk rather than take the train. Further distances I bike if it’s warm enough. And outlying distances for me, like Alexandria, Vienna, Silver Spring- I avoid going to if possible. Hello, I’m starting a new site that is geared for disabled persons in the Metropolitan area. This site will be for disable persons to submit areas in Wash. DC, Maryland and Virginia to give credit to businesses, theaters, bars, clubs etc that are TRULY handicap accessible. The setback is…I don’t have a disability, you see. I’ve been a paratransit operator for 3 years and alot of my riders have become friends. One day I dropped a guy off at the Marriott hotel in Greenbelt to go to the bar. He told me he had called ahead to ask if they were accessible. They told him they were. When I picked him up 6 hours later, he told me that they made him go out of the front, around the parking lot and he and his date entered through the kitchen. When they went to eat, they had to wait 45 mins as other diners were uprooted and reseated..WITH food in hand. The look of embarrassment and shame doused his face. When he went to the bar section, there was a 7 inch step that hindered him from entering the bar area. I’m looking to set up a “directory” as well as an interactive community on this website. Somewhere that they can submit places that are TRULY accessible by persons with ALL disabilities. If you guy/gals could possibly take a look at it and tell me what else would be relevant OR even a mention on your site/blog, I’d greatfully ad a permalink to your site as well as a few others once the final designs are complete. I really don’t understand this fascination with a flat-rate fare that I keep hearing around town. 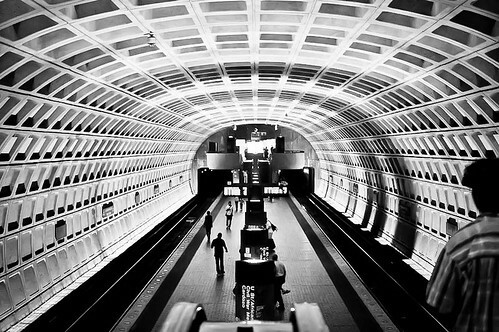 Those who really Love DC, as the blog name suggests, wouldn’t want to penalize DC & Arlington residents who take transit, rather than road-clogging and pollution-spewing cars, to make their trips around town — while giving a huge and highly regressive gift to some of the country’s wealthiest, sprawliest suburbs. Within DC & Arlington, Metro charges a $1.60 base fare which is actually one of the cheapest for a subway in North America; you’ll pay almost twice that (C$3) just for a mile-long bus ride in Toronto. The vast majority of people paying that short-distance fare are indeed actually residents, not tourists, and many of those people are transit-dependent and lower-income. - people are willing to pay more for longer trips at peak hours. Confused tourists do not merit a new fare system, they merit a better way of presenting the information at fare machines. Presenting a map instead of a table of fares might work; I could quickly figure out ticket prices in Japan that way, even at stations where nothing was in English; selling 1/2/3-day passes and roundtrip tickets would certainly simplify matters; and fare vending machines should have larger, more informative displays with more helpful prompts. We never question why the New Jersey Turnpike or American Airlines factors distance into pricing, so why is it bad for transit? We don’t incessantly whine about how restaurants charge more for dinner than lunch, so why whine about peak fares? It’s telling that very few new subway systems use flat-rate pricing, and in fact some newer, all-electronic transit systems have even more bewildering pricing schemes — Singapore changes road tolls every five minutes, Capital Bikeshare has four pricing bands — so that the price properly matches up the cost of providing the service with user incentives. Those transit systems that have flat-rate prices are usually older systems with antiquated, token-based fare collection systems. We live in the 21st century, so let’s use the technology that we have to make things smarter and better. Pittsburgh should really not be used to support an argument in favor of any transit policy Allegheny County implements- public transit in Pittsburgh is a joke compared to DC. A lot of really good comments here, and Payton does a really good job of arguing against the flat rate system, but I want to highlight Don’s comments. The issue he raises about time and reliability is the result of a whole host of factors not entirely related to this post, but it’s a big issue nonetheless. All things considered, Metro overall is the fastest, safest and most efficient way to get around DC, with only bicycles and motorbikes besting it in some circumstances. It’s insane to own a car in DC if you don’t absolutely need it. But in response to some of the reliability and predictability issues with Metro, I’ve had to adopt a “one hour rule,” which is that if I’m going anywhere that requires me to transfer at L’Enfant Plaza, Metro Center or Chinatown, I budget an hour to get there. Sure, sometimes I arrive at my destination with PLENTY of time to spare (Whoa, I got from the Hill to Columbia Heights in 15 minutes? Sweet!). But more often than not, these seemingly short intra-city trips take just under an hour, no matter what time of day. The Orange or Blue train might just happen to be there once I reach the platform at Capitol South (always a good feeling), but once I get to L’Enfant Plaza, the next northbound Yellow or Green doesn’t arrive for another 15 or 20 minutes. Add to that the common experience of being in a train that has to stop in the middle of a tunnel for several seconds or even minutes at a time, and it starts to seem like it takes an hour to get from any one point in DC to another.